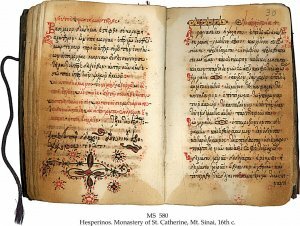 Description	 MS in Greek on paper, Mt. Sinai, Egypt, 16th c., 34 ff. 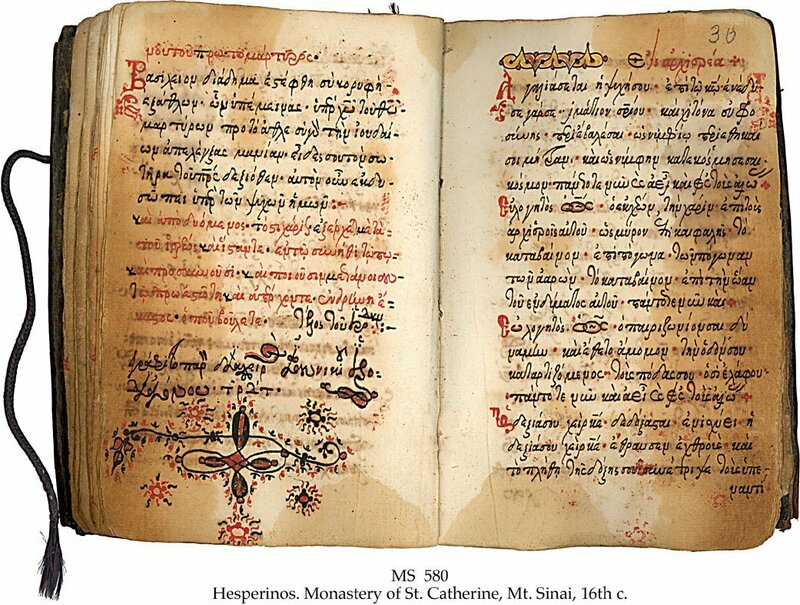 (complete), 14x9 cm, single column, (10x6 cm), 15 lines in Greek minuscule, signed by the scribe Ioannikos Diaconos, 2-line decorated initials in red, head- and end-pieces in multicolour knotwork. Binding	 Binding: Mt. Sinai, Egypt, 16th c., blindtooled leather, sewn on 3 thongs. Provenance	 1. Monastery of St. Catherine, Mt. Sinai (16th - 19th c.); 2. Friedrich Grote, Germany (ca. 1900); 3. Walther Adam, Magdeburg and Goslar, S 3 (1918/30-1964); 4. Carl Wilhelm Adam, Goslar (1964-1987); 5. F. Dörling, Hamburg 1.6.1987:34; 6. Wolfgang Görigk, Germany (1989); 7. Sam Fogg Rare Books Ltd., London. Commentary	 Commentary: There are 20 MSS from Mt. Sinai in The Schøyen Collection. Besides the monastery's own famous library (4300 MSS), only British Library (8 MSS) and The National Library of Russia, St. Petersburg (60 MSS, mostly fragments), have comparable holdings.